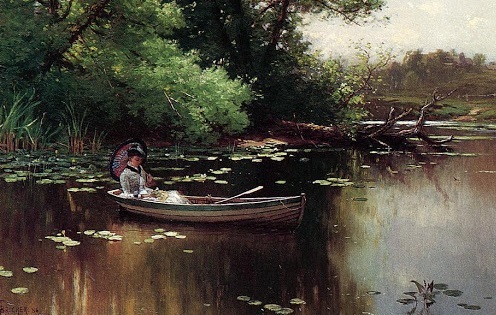 Detail from Drifting (1886), oil on canvas by Alfred Thompson Bricher (American painter, 1837–1908). Image courtesy of Barbara Wells Sarudy’s 19c American Women website. 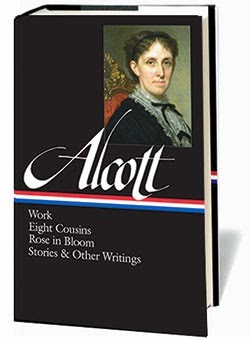 While she was writing Work, Alcott was inundated with requests for short stories and essays. The editor of Youth’s Companion offered to purchase, sight unseen, half a dozen stories she had yet not even written, and similar offers poured from other magazines. Almost immediately upon finishing the novel, she wrote “Anna’s Whim” and sold it for the then-considerable sum of $100 to a prominent weekly New York newspaper called The Independent. Combining a love story with a battle-of-the-sexes plot, the tale revisits several of the ideas Alcott tackled in Work, and the central focus is the title character’s “whim”—Anna’s wish that men treat women the same way they treat each other. Notes: The passing reference to a Mrs. Grundy (page 827) is to a narrowly conventional or priggish person, after a character in Thomas Morton’s 1798 play Speed the Plough. The mad gentleman and Mrs. Nickleby (p. 839) are allusions to Dickens’s Life and Adventures of Nicholas Nickleby, specifically when Nicholas’s mother rejects the advances of their neighbor and becomes convinced that he went mad because of her rejection. “Put my fortune to the touch and win or lose it all” (p. 844) is a paraphrase of two lines from the poem “My dear and only love” (1643) by James Graham, Marquess of Montrose. “Now just look at that!” cried a young lady, pausing suddenly in her restless march. . . . If you don't see the full selection below, click here (PDF) or click here (Google Docs) to read it—free!